Many farm workers are facing a unique anguish right now. In the best of times, non-union farm workers’ wages are pitifully low. But as the days grow colder, their take-home pay decreases even more. Click here to read more about the struggles facing farm workers and to find out how to support them. Please help families who are in need this holiday season! We are collecting new, unwrapped gifts for the annual Presents From Partners toy drive, and warm blankets and coats for IBEW’s Renew program to be donated to the Union Gospel Mission. We have drop-off boxes located in the lobby of our office at 3645 SE 32nd Ave in Portland. Blankets and coats will be collected until 12/9, and toys until 12/13. Thanksgiving marks the beginning of the holiday shopping season and it’s important to support businesses who support their workers. If you’re planning to shop on “Black Friday,” consider shopping at a retailer who put their workers ahead of profits and kept their doors closed on Thanksgiving. ThinkProgress has a list of those retailers. Thanksgiving is a holiday of solidarity—commemorating a short-lived moment when Pilgrims and Native Americans broke bread together at a common table. This Thanksgiving, America’s working people and our unions are committed to standing with each other—in solidarity. We are reminded this holiday season of President Franklin Roosevelt’s Four Freedoms—freedom of speech, freedom of religion, freedom from want, and most of all, freedom from fear. Thanksgiving is a holiday of plenty—a celebration of the bounty that hard work in America can and should bring. This election season we heard many promises of plenty—promises to create jobs, to raise wages, to protect working people from economic insecurity. Yet we know the business lobbyists are already making plans for how the Trump administration can cut working people’s wages, privatize Medicare and Social Security and attack workers’ rights on the job. This Thanksgiving, the labor movement reaffirms our commitment to hold America’s newly elected president accountable to the promises he made to working people. Thanksgiving is a holiday created to bind us together. Yet all across our nation, the presidential election and its aftermath have left too many who do the work of America feeling vulnerable—immigrants, people of color, Muslims, women and the LGBTQ community. Afraid they will be scapegoated, afraid they and their families could be the target of the kind of persecution that led the Pilgrims to come here in the first place. 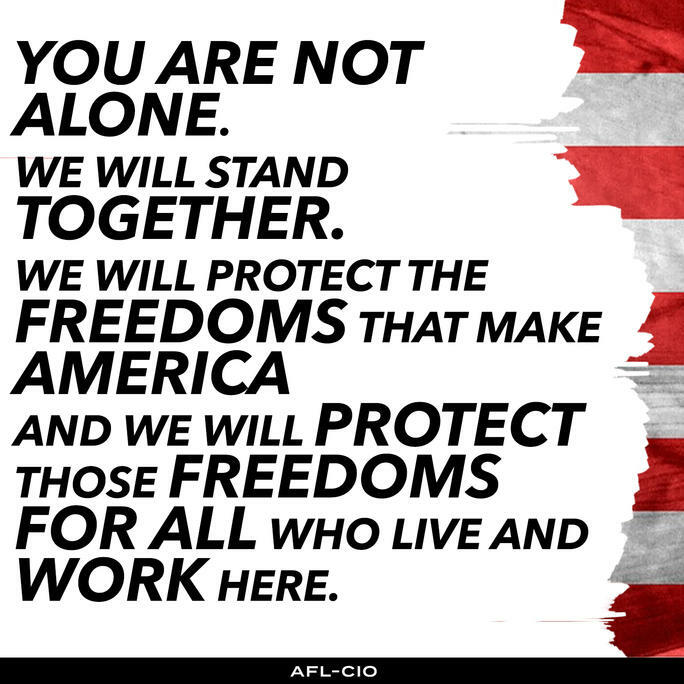 The labor movement has one message for all our members and indeed for all working people—YOU ARE NOT ALONE. WE WILL STAND TOGETHER. WE WILL PROTECT THE FREEDOMS THAT MAKE AMERICA – AND WE WILL PROTECT THOSE FREEDOMS FOR ALL WHO LIVE AND WORK HERE. Thanksgiving is a holiday that reminds us of our history as a country. Of our best moments, and the hopes they embodied. We are a nation that fought fascism. Our military cemeteries are filled with men and women who gave their all in that fight. Our National Mall honors Abraham Lincoln and Martin Luther King Jr.— heroes in the fight against racism. Working people expect that those entrusted with leading our nation are worthy of this inheritance, an inheritance for which we are truly thankful. In a shocking and wrongly-decided opinion, a U.S. district court judge in the Eastern District of Texas has taken away overtime protection from millions of American workers. Yesterday, Judge Amos Mazzant issued an injunction to stop the Barack Obama administration’s update of federal overtime eligibility rules, which was scheduled to take effect on December 1, 2016. The updated rule is designed to restore overtime protections for an estimated 4.2 million workers, while making it harder for employers to deny overtime to another 8.9 million workers who are already overtime-eligible. Equally shocking was Mazzant’s reasoning. He argued that the Labor Department does not have legal authority to set a minimum salary threshold below which workers are guaranteed overtime protection. The administration’s new rules would raise the overtime salary threshold from $23,660 to $47,476. This is an extreme decision that ignores 78 years of precedent. The Labor Department has been exercising its authority to apply a minimum salary threshold since 1938. It has increased the threshold seven times, most recently in 2004 under President George W. Bush. Congress has amended the overtime law several times and never objected to the minimum salary threshold, and no court had previously ruled that the salary threshold violated congressional intent. We strongly disagree with the decision by the court, which has the effect of delaying a fair day's pay for a long day's work for millions of hardworking Americans. The department's overtime rule is the result of a comprehensive, inclusive rule-making process, and we remain confident in the legality of all aspects of the rule. We are currently considering all of our legal options. This is an extreme and unsupportable decision and is a clear overreach by the court. For 78 years the Department of Labor has used salary as well as duties to determine overtime eligibility. Congress has amended the Fair Labor Standards Act many times and has never objected to the salary test. The law is clear on this. The District Court’s ruling is wrong. Supporters of the rule are considering a range of legal strategies, and it’s premature to speculate about the course they’ll pursue if an appeal is filed. We believe the judge’s analysis and decision are deeply flawed and should be reversed on appeal. Today’s decision from the Eastern District of Texas represents a major setback for the country’s workers. By siding with the big business lobby and granting an injunction against the Department of Labor’s plan to raise the overtime salary threshold from $23,660 to $47,476 a year, one judge has prevented millions of Americans, who are not currently guaranteed overtime protections, from getting a much needed raise. A single judge in Texas has ignored 78 years of legal precedent and taken money out of the pockets of millions of working people across the country by blocking the long overdue update of the overtime rule. These workers, the majority of whom are women, earn modest salaries, work long hours and have just been told that they will still be denied fair pay… The National Women’s Law Center calls on the incoming Administration to affirm that it will fight to raise the wages of working people by vigorously defending the overtime rule. The main intended beneficiaries of the rule were lower-middle-class workers earning between the old and new thresholds. In one of the signature moves of the pre-implementation period, Walmart raised the wages of its managers above the new threshold. This group of workers includes a diverse set of working-class workers, including a big slice of the white working class workers without a college degree who voted for Donald Trump in record numbers. Workers with only a high school degree make up 25% of the potential salaried beneficiaries of the new rules, but only 15% of the total workforce. The new overtime rule was one of the most reliable levers available to policy makers who want to take action on the stagnant wages of those earning above the minimum wage. Older PostWeekly Update: We Will Fight.